Rio School District officials announced this week that they have received more than $6.4 million worth of grants to help homeless students and local families and support outreach programs. Grant funds are expected to help boost literacy, increase access to technology and boost outreach efforts to the Mixteco population in the district, officials said. Federal grants were awarded to both the Boys & Girls Clubs of Greater Oxnard and Port Hueneme, which runs after-school programs on Rio campuses, and the district. The money will help increase access to the Mixteco population and parental involvement in after-school activities. Other grants will provide funding for technology resources at schools and help homeless students gain access to school meals, enrichment activities and tutoring. Gov. Arnold Schwarzenegger recently proposed a state budget for 2010-2011. The segments of society that took the biggest budget hits in 2009, those groups that are the most vulnerable and the least powerful, are again directly in the bull’s-eye of even more severe budget cuts. That leaves a gaping hole in the safety net of government programs that were the last resources available to individuals struggling to survive. Stepping up to the challenge of softening the fiscal blows are local nonprofit organizations. Ventura County can consider itself lucky to be the home of some very dedicated groups. These organizations are themselves weathering the economic storm of the century. But remarkable leadership combined with creative flexibility and a large increase in community goodwill are keeping these nonprofit groups afloat and even expanding their reach. There is hope and there is help. The nonprofit group California Budget Project has crunched the employment numbers and summarized what they really mean. There is currently the same number of jobs in the state as there were at the turn of the century in 2000. This, despite the fact there are now 3.3 million additional working-age residents. As to how productive that potential work force is, fewer than three out of five working-age adults are employed. You have to go back to 1977 to revisit that surprisingly low level of employment. Although all sectors of the job market have been slammed, two of the three most affected were the construction and financial industries. Those are two of the most important segments of Ventura County’s economy. For those who have lost their jobs, more than one out of four was still looking for work after six months. That is the highest level ever recorded in the state. Only half of those who were unemployed in California (50.6 percent) during the first quarter of 2009 received unemployment insurance benefits, according to California Budget Project‘s Key Findings report. It stated that 37 other states had a higher rate of unemployed residents who qualified to received unemployment insurance. Finally, California is rapidly losing its middle class. Workers’ hourly wages have continued to lose purchasing power during this recession, as the gap between low-wage and high-wage earners has been widening for an entire generation. The wealthiest 1 percent of taxpayers in California saw their adjusted gross income increase at 13 times the rate of middle-income taxpayers. Even before the current recession picked up speed, in 2007 the wealthiest 1 percent of the country’s workers had the lion’s share of the earned income. That share of the wealth at the tippy-top of the highest-wage earners was larger only once in history, and that was in 1928. What is true for the nation is now amplified for this state. When California can’t pay its bills, funding for the individual counties is drastically reduced. When that funding is no longer available, the nonprofit organizations are left without the resources to continue to help those in need. Fundraising has been difficult across the board for these groups, primarily because companies and individuals who have been the backbone of donations are also hurting and therefore must give less, a different definition of the trickle-down theory. The “good” to which Weigel refers is an increased awareness and sensitivity to others in the community who may be having a difficult time. She said the widespread pain of lost jobs, reduced hours, cuts in pay, elimination of benefits and other hardships has seeped deeply into the middle class. It could be your neighbor or someone in your family, but nearly everyone knows someone who has endured some loss. There has also been an increase in the number of people who are now volunteering. “It is good for them; they find it is energizing and gives them perspective and a grace as well. It has left an impression that they will take with them,” Weigel said. One dollar provides $7.15 worth of groceries from FOOD Share. Seven cents of every donated dollar goes to running the organization and the rest goes to the food program, primarily because of the enormous volunteer effort. With the price of groceries continuing to spiral upwards, this matters. “I could do a whole poverty conference on the inequitable distribution of food,” Weigel said. “Food costs are now crazy.” She said small steps such as growing vegetables at home in containers can help provide nutrition at practically no cost. She encourages people to brown bag their lunch once a week and donate the money they would have spent to buy lunch to a food pantry. Or when the fruit in your backyard ripens and there is more than your family can possibly eat, just call FOOD Share and they will send out volunteers to pick it and take it away. Under the present state budget, health care for the poor has been drastically cut back. Specifically, Medi-Cal programs were pared, eligibility was tightened, premiums were raised, and some benefits were completely eliminated. More than $2 billion was cut from the state’s health programs. At least two million Californians were affected when many Medi-Cal benefits were wiped out. Services no longer being provided include dental care, hearing and speech services, eyeglasses and psychological services. The county staffs that administer those programs were reduced, including staff to help families navigate the system to receive benefits. Even those who were willing to purchase high-priced state-sponsored health insurance because they were unable to qualify for private insurance saw the Major Risk Medical Insurance Program slashed by $6.6 million. And the list goes on, with the budget ax now poised once again to chop even more program, in the coming year. No wonder so many people are worried sick. Jewish Family Services expanded its counseling services a few years ago to include the children of struggling parents. “We see a lot of kids in the schools who are very stressed by their family’s financial situation,” Balchum said. The Boys and Girls Clubs are another place for children to escape the stresses of home and school. Meggan McCarthy is the director of special events and marketing of the Greater Oxnard and Port Hueneme branch. She said that in Ventura County, there are three full-service clubs that serve 7,200 members annually. The Ojai Foundation recently laid off six of its nine staff members due to financial constraints. The group focuses on teaching environmental sustainability, a kinship with nature, and nonviolence. The group is less active during the winter, and the foundation leaders said in a statement that it only made sense to reduce the staff in order to save money. The Ventura County Arts Council has had to fight and claw for every single dollar under the Schwarzenegger Administration. Not just because the Governor is not supportive, but because the Legislature has been at odds with itself over declining tax dollars for years. In the heat of the hand-to-hand combat for funding, the arts often get lost in the struggle. The organization’s fiscal situation is directly tied to that of the California Arts Council. “Ten years ago, when I started in this position, we were getting $40,000 as a partner,” Travers said. “From 2003 to 2006 we got absolutely nothing. Travers said the problem cannot be blamed entirely on the governor, but must be shared with the state legislature. In contrast, restoration of the Libbey Bowl in Ojai is the focus of a major fundraising project. Anna Cho is the director of the campaign to raise $1 million to supplement the $2 million that has been allocated by the city of Ojai to rehabilitate the old building at the concert site. Cho is working with the Ojai Valley Service Foundation to bring the venue back to its former glory days. The Libbey Bowl will be closed this coming summer but will reopen in June 2011. One of the least visible but growing segments of the battered economy comprises people with serious mental illness and their families. One organization is there to provide as much help as possible. The National Alliance on Mental Illness (NAMI) of Ventura County is headed by Executive Director Ratan Bhavnani. He said NAMI is the go-to resource for referrals for all aspects of aid for the mentally ill and their families. Although some new programs have stepped up to fill the void, the cuts have been damaging. But NAMI and its staff of one full-time director and one part-time worker plow ahead, trying to match the needs of the clients with the appropriate programs. “We are certainly the center of all things mental illness, and we can help them find the right resources,” Bhavnani said. Keary Colbert was learning the fundamentals of football at the Boys & Girls Clubs of Greater Oxnard and Port Hueneme long before he was a professional football player. “From the flag football games there to the fundamentals of good character and leadership I learned to be great — to follow my dreams and to create something bigger than myself by giving back to the community,” said Colbert, 27, of Oxnard, a free agent with the NFL who has played for the Denver Broncos, Seattle Seahawks, Detroit Lions and Florida Tuskers. In an effort to inspire other youths to pursue their passion in life, Colbert is giving back to his local club as a spokesperson for Be Great, a national Boys & Girls Club campaign that has been localized by the Boys & Girls Clubs of Greater Oxnard and Port Hueneme. “I am just one of hundreds of thousands of club alumni across the nation whose lives were altered in positive ways and are now in a position to give back to our communities — another value we learned at the club,” Colbert said. The national effort features billboards with faces of past club alumni, including celebrities like Denzel Washington and Martin Sheen. The localized campaign showcases billboards throughout Oxnard — and most visibly along the northbound 101 freeway at the Del Norte exit — featuring a photo of Colbert. Oxnard Police Chief John Crombach will be featured in coming months. The effort is part of a nationwide initiative by Boys & Girls Clubs of America to highlight the key issues affecting today’s young people, and the key role community-based organizations like Boys & Girls Clubs play in helping kids graduate from high school, achieve a healthy lifestyle and develop good character traits, said Tim Blaylock, chief professional officer at the Boys & Girls Clubs of Greater Oxnard and Port Hueneme. “We all know the great stories of Denzel Washington, Martin Sheen, Mario Lopez and many others and their relationships with their individual Boys & Girls Clubs,” said Blaylock, noting that these testimonials can be found online at BeGreatAmerica.org. It seemed only fitting to kick off the campaign with Keary Colbert, an alumnus of the club’s Port Hueneme branch, a graduate of USC and an NFL player. Growing up in Ventura County, Colbert joined the Boys & Girls Club when he was in elementary school and later attended Hueneme High School in Oxnard, where he lettered in football, track and basketball. He also played football as a youth for the Port Hueneme Rhinos. “Keary was a true blue club kid growing up in Oxnard and is a philanthropist, volunteer and great role model for our youth locally,” Blaylock said. “He is giving back because it made a difference in his life, and he would like to see that replicated for other youth in our community. For more information about the Be Great campaign, or to make a donation, go to http://www.BeGreatOxnard.org. Long before I was a professional football player, I was learning the fundamentals of the game at the Boys & Girls Clubs of Greater Oxnard and Port Hueneme. From the flag football games there to the fundamentals of good character and leadership, at the club, I learned to “Be Great,” to follow my dreams and to create something bigger than myself by giving back to the community. I joined the club in elementary school during summer break while my parents worked full time. With great adult supervision in a safe and secure environment, the club proved to be the best place to spend my free time. There, I stayed sharp on schoolwork and also enjoyed games, activities and field trips. My first foray into sports began in elementary school with a club basketball league. In middle school, my basketball coach, who was a club employee, formed Oxnard’s first traveling boys basketball team, the Hueneme Rebels, with players from schools across the Oxnard/Port Hueneme region. We brought many championship trophies back to the city of Oxnard, playing in tournaments in Santa Barbara and Ventura counties. As kids, being able to come together with other kids from different schools, races and backgrounds with a common goal was one of my best memories. Many of the players have kept in contact with each other and have built strong friendships that last to this day. I also joined the flag football team, playing in a league at Beck Park. Contrary to popular belief, I have not always been a “star” in football. Playing a year of flag football taught me basic fundamentals of the game and gave me confidence to play tackle football the following year. It has taken a lot of getting knocked down and getting back up to help me grow and appreciate the football player I have become today. While the club taught me game fundamentals, it was Port Hueneme Club Director Chuck Muncie who taught me the fundamentals of mentoring. A former NFL star, he had faced his share of trials and tribulations in life, but was dedicated to mentoring, encouraging and helping kids make smart decisions. I remember being in awe that he played professional sports. As a kid, being able to interact with someone like him gave me a sense of hope that I could make it, too. The club and my parents helped me realize potential I didn’t know I had! After growing up, I realized I could become a blessing in a child’s life, either directly or indirectly, as Chuck was a blessing to me. So, when my parents told me they had seen an article in the Ventura County Star discussing the club’s fundraising needs, I decided to return a small portion of what the club had given me. I now love going back and interacting with the club kids because I was once that kid in the club, and I realize they will be our future leaders. 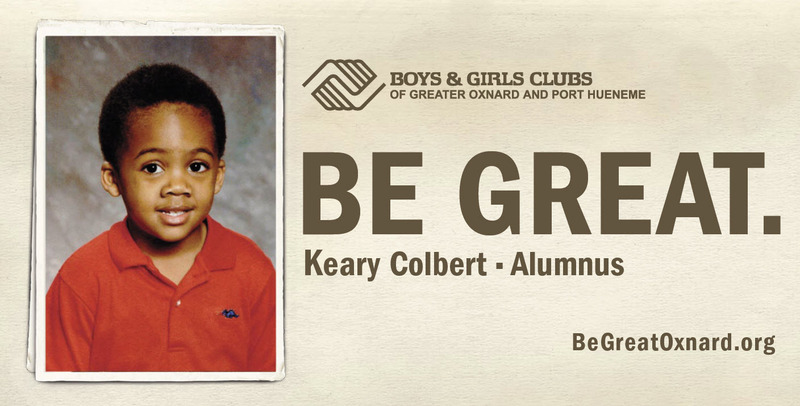 As spokesperson of the Oxnard and Port Hueneme Clubs’ “Be Great” campaign, celebrating the opportunity and hope the Boys & Girls Clubs give youths, and inviting more youths to join and “Be Great!” I am just one of hundreds of thousands of club alumni across the nation whose life was altered in positive ways, and are now in a position to give back to our communities — another value we learned at the club. For more information on the clubs or on the Be Great campaign, go to http://www.BeGreatOxnard.org. — Keary Colbert is a free agent with the National Football League and an alumnus of the Boys & Girls Clubs of Greater Oxnard and Port Hueneme. Over those years, we’ve seen extraordinary progress and yet our society’s continued challenges remind us where we’ve fallen short of King’s ideals. Today, 40 million Americans — including 15 million children — live in poverty. More than 3.5 million Americans are homeless. We lose too many young people to the evils of drugs, violence and hopelessness. We can do more! January is national Mentoring Month. While programs such as Boys & Girls Clubs and Big Brothers Big Sisters engage youths in positive and fun activities, mentoring also has a tremendous impact on education and graduation rates. The evidence shows that students who participate in such programs experience improved grades, higher attendance and a more positive attitude. Further, they experience measurable decreases in alcohol and drug use, violence, skipping school and dropping out. Research has also shown that programs that rely on volunteer mentors can play a powerful role in reducing drug abuse and youth violence while greatly enhancing a young person’s prospects for leading a healthy and productive life. Youths begin to believe in themselves and their capabilities when someone, who is not paid to care about them, believes in them anyway. Being a mentor is the quintessential way to volunteer, and a meaningful mentoring relationship can last a lifetime. At Boys & Girls Clubs of Greater Oxnard and Port Hueneme and Big Brothers Big Sisters of Ventura County, we understand the critical importance of volunteering and the impact one person’s time, effort and care can have on the lives of one, two thousands of others. When you were a child or young adult, was there someone in your life — a teacher, neighbor, relative, coach, friend, or boss — who encouraged you, showed you the ropes and helped you become who you are today? That person was a mentor to you. Thursday is “Thank Your Mentor Day.” Join many others in honoring an important mentor in your life. Find that mentor and tell him how much you appreciate him, or communicate by sending a card, e-mail or via a phone call. Becoming a mentor to a young person in your community by visiting http://www.bbsvc.org or http:// http://www.positiveplace4kids.org. Serve your community on Martin Luther King Jr. Day of Service by deciding to become a mentor and by making a donation to Big Brothers Big Sisters or Boys & Girls Clubs of Greater Oxnard and Port Hueneme. Our gratitude goes to the people who are devoted to seeing our youths succeed in life. Mentoring Month is a special time to recognize their deeds and is also a time to encourage more people to become mentors. What you will find is that not only are you helping someone else succeed, but your life will be greatly enhanced at the same time. It is our hope that the people of our community will take the opportunity to share their time and talents with young people all over Ventura County. Our communities are full of fantastic children who have the ability to achieve greatness, and dedicated mentors can help them unlock their potential. — Lynne West is the chief executive officer of the Big Bothers Big Sister of Ventura County. Tim Blaylock is the chief professional officer of Boys & Girls Clubs of Greater Oxnard and Port Hueneme and a trustee with the Rio School District. (Oxnard, CA) – What do Denzel Washington, Martin Sheen, General Wesley Clark, Keary Colbert and Oxnard Chief of Police John Crombach have in common? All five are products of the Boys & Girls Clubs. And the faces of our local alumni and community leaders – from when they were young members of the Club – will be appearing throughout Oxnard in 2010 promoting the important work of our local Clubs. Billboards proclaiming the Boys & Girls Clubs’ new BE GREAT advocacy campaign will be posted around the city. The messages are part of a nationwide initiative by Boys & Girls Clubs of America (BGCA) to highlight the key issues affecting today’s young people, and the key role community-based organizations like Boys & Girls Clubs play in helping kids graduate from high school, achieve a healthy lifestyle, and develop good character traits. The BE GREAT campaign emphasizes a spirit of optimism and hope, reinforcing the positive benefits of Boys & Girls Clubs by focusing on the personal success stories of accomplished alumni, celebrities and non-celebrities alike. At the campaign’s Web site (www.BeGreatOxnard.org), visitors can learn more about the featured alumni, join the alumni association, volunteer, become and member and make a donation. As we begin this fresh, new decade together, please take a moment to think about the difference you can make by helping to support young people. In doing so, you are creating a better community for generations to come. — Dropouts are more likely to be on welfare. — They are more likely to be unemployed. Fifty-four percent of all high school dropouts are jobless. Among African-Americans without a diploma, the unemployment rate soars to a shocking 70 percent. Worse yet, far too often, today’s dropouts are tomorrow’s criminal offenders. The U.S. prison inmate population has swelled to 2.3 million. And 75 percent of prison inmates do not have high school diplomas. — The average high school graduation rate is 75 percent — and for Latino and African- American males, the graduation rate drops to 50 percent. — In Oxnard and Port Hueneme, the graduation rate is 62 percent. — Less than one-third of eighth-graders perform at a proficient level in math. — Reading proficiency levels drop as students enter middle school. It’s shocking that the U.S. is now the only industrialized country in the world in which young people are less likely than their parents to earn a high school diploma. We cannot allow this! The greatest crisis we face is the crisis in our families, communities and in education. As individuals, there may well be little we can do about our nation’s economic crisis. But we sure can do something about the future of our community through the great work of our Boys & Girls Club organization and collaborative partners. I believe there is no organization outside our education system that has a greater capacity and responsibility to positively influence children than the Boys & Girls Clubs of Greater Oxnard and Port Hueneme. Ninety-six percent of those who attend our clubs graduate from high school! We are changing and saving lives. We have more than 18 clubs serving 7,500 youths annually. This service so uniquely qualifies the clubs to make an exceptional contribution to community that we must continue to do it and we must broaden our impact. The Boys & Girls Clubs are working to bring out the best in each young person. Boys & Girls Clubs of Greater Oxnard and Port Hueneme is giving them their future. In so doing, they are giving Oxnard and Port Hueneme its future. But, even as our organization becomes more critical to the stability and success of our community, we face cutbacks in revenue from all sources. It is crunch time for us, for places that serve as safe havens and vital support centers for children and their parents. For 2010, I ask you to make a commitment to be the difference. Think of ways you can help: volunteering at a clubhouse, donating to our cause, mentoring and leading by example. Sponsor a program, a piece of equipment or make a financial contribution that will give one young person a full year at the club — a proven path to their high school diploma and a confident, positive future of possibilities. In a time of economic turmoil, educating our youngest generation is more important than ever. With your support, the future of our young people and our community can be one of hope and opportunity. Together we can be the difference for our youths! — Tim Blaylock is chief professional officer of the Boys & Girls Clubs of Greater Oxnard and Port Hueneme, http://www.positiveplace4kids.org. Phone: 805-815-4959, ext. 203. (Source: Ventura County Star)By Kathleen Wilson, Ventura County Star, Calif.
Dec. 31–With today forecast as the biggest day of the year for online giving, growing numbers of donors are beating the tax deadline while doing their bit for charity. Contributors made 13.2 times more online gifts last Dec. 31 than the daily average for the rest of 2008, according to national figures for charities using software by Convio, a company in Austin, Texas. The firm also reported the charities raised 22.5 times more money than they did on an average day. While the figures don’t cover every online gift made in the nation, the firm accounts for 7 to 8 percent of an estimated $10 billion given online. In Ventura County, nonprofit managers say the finding squares with the increase in donations they see today and all week long. “We’re all procrastinators,” said Jeanne Benitez, development director at FOOD Share, the regional food bank in Oxnard. Although many older donors still prefer sending checks by mail or dropping them off in person, contributors in their 30s and 40s often favor online giving, officials say. Not only is it quick and cheap, but contributors can print receipts to prove to the Internal Revenue Service that they really did give by 11:59 tonight, charity officials say. Westlake Village businessman Kash Dadvand, 39, said online giving fits into his lifestyle. “I’m a nerd at heart,” said the owner of Zumablue.com, a marketing and graphics firm. Dadvand, a supporter of Boys & Girls Clubs around the area, recently put on his own private fundraiser on Facebook. He invited friends to contribute instead of giving him birthday presents, raising a few hundred dollars for the clubs in Oxnard and Port Hueneme. Still, many contributors don’t trust any purchase over the Net. “I don’t order anything on the computer,” said retired nurse Willa De Lay, 92, of Oxnard, a regular contributor to the Boys & Girls Clubs of Greater Oxnard and Port Hueneme. “There’s been a lot of problems,” she said, adding that she’s concerned about viruses and identity theft. “I don’t like my e-mail to get out to everybody, so I like to write checks,” De Lay said. Linda le Brock, development director for the clubs, sees the advantage in both approaches. Contributors may see a direct-mail piece, then give when they get an e-mail solicitation later. “There’s multiple touches that make it more effective,” she said. Convio reports city-by-city figures for contributors giving to its clients, which include the American Diabetes Association, the American Red Cross, Easter Seals, the National Multiple Sclerosis Society and the Humane Society of the United States. Alexandria, Va., Cambridge, Mass., Minneapolis, Minn., Washington, D.C., and Arlington, Va., led the list of cities giving the most per capita online in 2008. In Ventura County, Thousand Oaks ranked in the top third, finishing 85th among 273 cities with populations over 100,000. Among small cities, the highest finisher in the county was Camarillo, which ranked in the top fifth among cities of less than 100,000 based on the amount given online. At about $10 billion, online giving accounts for only a fraction of the $300 billion given annually in the United States. Charity heads say direct mail and face-to-face meetings with contributors are still critical, but online fundraising brings in untapped money. “What it’s really done is identified some new donors for us,” said Tim Blaylock, president and CEO of the Oxnard-area Boys & Girls Clubs. It’s become so common that it’s the community standard, said Dena Jenson, vice president of the Ventura County Community Foundation. To see more of the Ventura County Star, or to subscribe to the newspaper, go to http://www.venturacountystar.com. Copyright (c) 2009, Ventura County Star, Calif.